The game Sequence is essentially a card game because it is played with a deck of cards. However, it is also a board game in that each player or team of players attempts to be the first to run a five-card sequence on the board before the other team. Making the game yourself is fairly simple, and it's cheaper than buying the game in stores. Remove the eight jacks from two full decks of playing cards. Using your scissors, cut all of the remaining 96 cards in half horizontally. 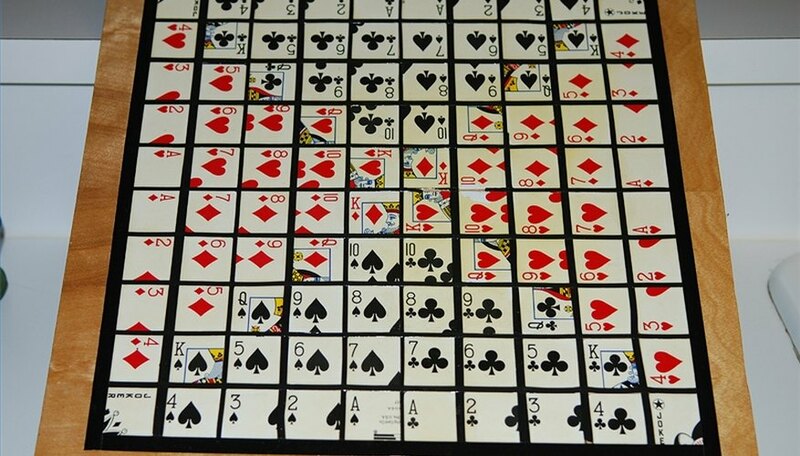 Arrange the cards face up in a specific order in a 10-by-10 inch layout, leaving the four corners open. The open corner slots count as free spaces for either team as they attempt to claim five spaces in a row, column or diagonal. You may cut the jacks and place them to serve as the wild spot for the four corners. Layout the first row with 4S, 3S, 2S, the ace of spades, then the ace of clubs, 2C, 3C, and 4C sequentially. 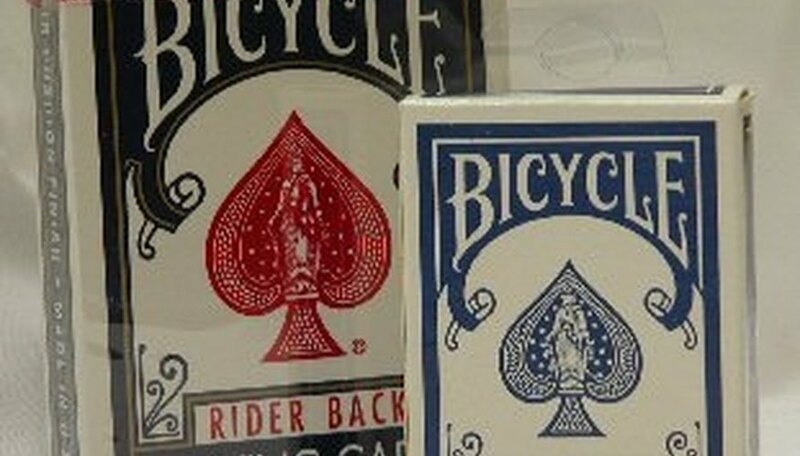 The second row starts with the 4 of diamonds, followed by the king of spades, 5S, 6S, 7S, then the 7C, 6C, 5C, the king of clubs and lastly the 4 of hearts. Place the 3 of diamonds to begin the third row. This is followed by the 5 of diamonds, queen of spades, 9S, 8S and then the 8C, 9C, queen of clubs, 5H and lastly the 3H. For the fourth row, place the 2D, 6D, 9D, 10S, 10C, the queen of hearts, then 9H, 6H, and 2H. For the fifth row begin with the ace of diamonds, followed by the 7D, 8D, 10D, king of diamonds, king of hearts, 10H, 8H, 7H, and ace of hearts. Lay down the ace of hearts to begin the sixth row. Follow with 7H, 8H, 10H, king of hearts, king of diamonds, 10D, 8D, 7D and then the ace of diamonds. For the seventh row, place the 2H, 6H, 9H, queen of hearts, 10C, 10S, queen of diamonds, 9D, 6D, 2D. Begin the eighth row with 3H, 5H, the queen of clubs, 9C, 8C, 8S, 9S, the queen of spades, 5D, and 3D. The ninth row contains the 4H, the king of clubs, 5C, 6C, 7C, 7S, 6S, 5S, the king of spades, and 4D. The 10th row begins with a jack or wild card. This is followed by 4C, 3C, 2C, ace of clubs, ace of spades, 2S, 3S, 4S and then finally another jack or wild card. Glue the backs of the cards to the board. Glue as you go to make the job quicker. Paint the board black before you start for a more finished look. Use caution when using scissors -- only cut through a few cards at a time to keep your cuts straight.